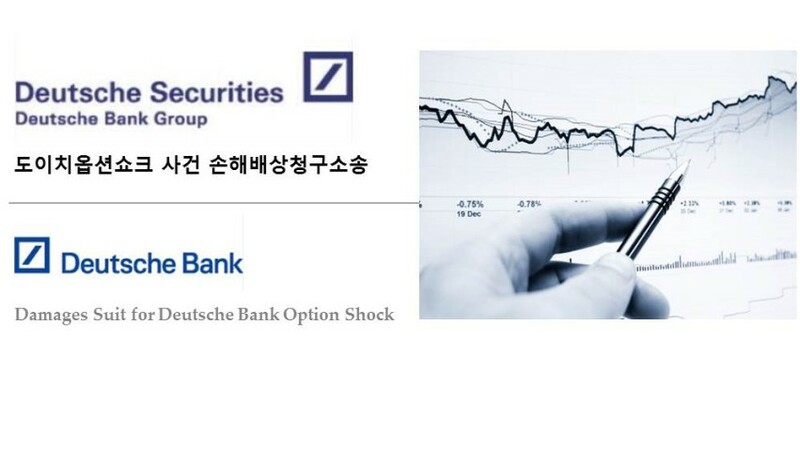 11.11. option shock scandal is an unprecedented market manipulation case where Deutsch Bank and Deutsch Securities colluded and performed massive sell-off of shares in the amount of 2.3 trillion won just before market closing on November 11, 2010, resulting in abrupt plunge of KOSPI 200 index. Due to this shock, Deutsch Bank and Deutsch Securities which held speculative positions betting on price decline earned 45 billion won while those holding options or ELW suffered hefy losses. In January 25, one of employees of Deutsch Securities pleaded guilty and was sentenced to 5 years in prison, and Deutsch Securities was imposed fines in the amount of 1.5 billion won with 1.2 billion won in disgorgement. Victims who filed for the dispute settlement are those suffered losses from the abrupt plunge of KOSPI 200 index on November 11, 2010, by holding either short put position or long call position for KOSPI 200 option (expiration date on November 2010) or ELWs equivalent to those options. This is a case against Deutsch Bank and Deutsch Securities in relation with the 11.11. option shock by individual investors for their losses.